What network design would contain the scope of disruptions on a network should a failure occur? Refer to the exhibit. Which devices exist in the failure domain when switch S3 loses power? Which design feature will limit the size of a failure domain in an enterprise network? A network administrator is planning redundant devices and cabling in a switched network to support high availability. 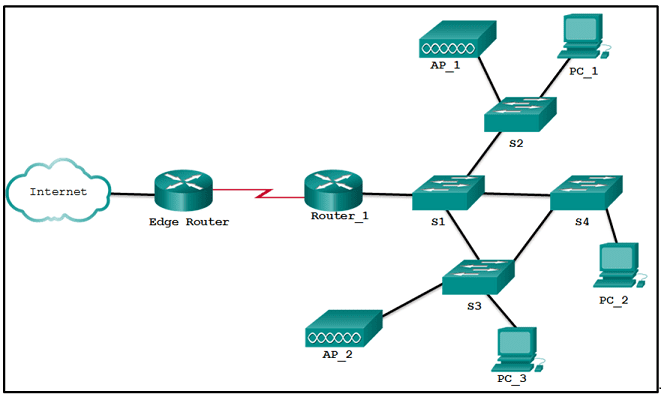 Which benefit will implementing the Spanning Tree Protocol provide to this design? Multiple physical interfaces can be combined into a single EtherChannel interface. Redundant paths can be available without causing logical Layer 2 loops. Network access can be expanded to support both wired and wireless devices. Faster convergence is available for advanced routing protocols. What capability is provided by the use of application-specific integrated circuits in Cisco multilayer switches? Which statement describes a characteristic of Cisco Meraki switches? They promote infrastructure scalability, operational continuity, and transport flexibility. They are cloud-managed access switches that enable virtual stacking of switches. They are campus LAN switches that perform the same functions as Cisco 2960 switches. They are service provider switches that aggregate traffic at the edge of the network. In which situation would a network administrator install a Cisco Nexus Series or Cisco Catalyst 6500 Series switch to promote infrastructure scalability? Which statement describes a characteristic of Cisco Catalyst 2960 switches? They do not support an active switched virtual interface (SVI) with IOS versions prior to 15.x. They are best used as distribution layer switches. New Cisco Catalyst 2960-C switches support PoE pass-through. It connects multiple IP networks. It manages the VLAN database. It increases the size of the broadcast domain. A network engineer is reviewing a network design that uses a fixed configuration enterprise router that supports both LAN and WAN connections. However, the engineer realizes that the router does not have enough interfaces to support growth and network expansion. Which type of device should be used as a​​ replacement? When a Cisco IOS device is being selected or upgraded, which option indicates the capabilities of the Cisco IOS device? Refer to the exhibit. Which command was issued on a Cisco switch that resulted in the exhibited output? What is a characteristic of in-band device management? It uses a terminal emulation client. It is used for initial configuration or when a network connection is unavailable. It uses a direct connection to a console or AUX port. It is used to monitor and make configuration changes to a network device over a network connection. Which type of information is displayed by the show ip protocols command that is issued from a router command prompt? A network technician needs to connect a PC to a Cisco network device for initial configuration. What is required to perform this device configuration?